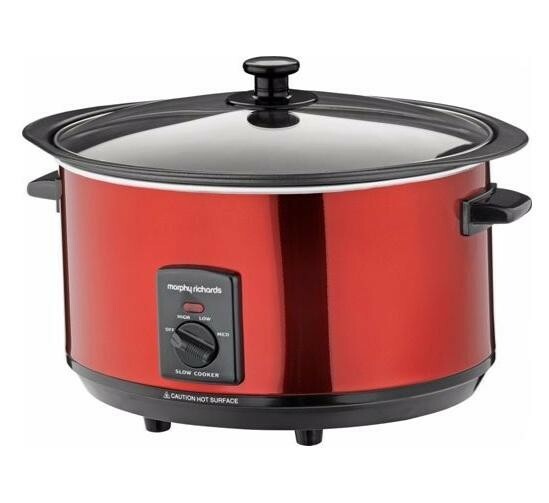 The Morphy Richards 461000 Accents Slow Cooker 6.5 Litre in red is the perfect kitchen appliance that not only lets your slow cook your favourite meals but also enables you to sear meats in the same pot ensuring there is less washing up. The large 6.5 litre capacity allows you to make delicious slow cooked stews that will feed the whole family and the 3 heat settings ensure that you cook it to perfection. The separate cooking pot allows you to place the pot on the table when finished cooking so everyone can dive in and taste the food then simply put the cooking pot and the glass lid in the dishwasher ready for next time.